On Sunday I set off across Wales to go and stay with my sister. Driving over the mountains the car started making a strange noise, followed almost immediately by a thump. I pulled into the first available lay-by and discovered my rear tyre on the drivers side was completely flat. I am happy to change a wheel, so I got the spare out, loosened the wheel nuts, jacked up the car, removed the nuts completely and… couldn’t get the wheel off. A young couple stopped to offer help. They couldn’t get the wheel off either. I do have breakdown cover so, reluctantly, I called the breakdown service and awaited their arrival. Then a BMW pulled up and a man got out and offered to help. 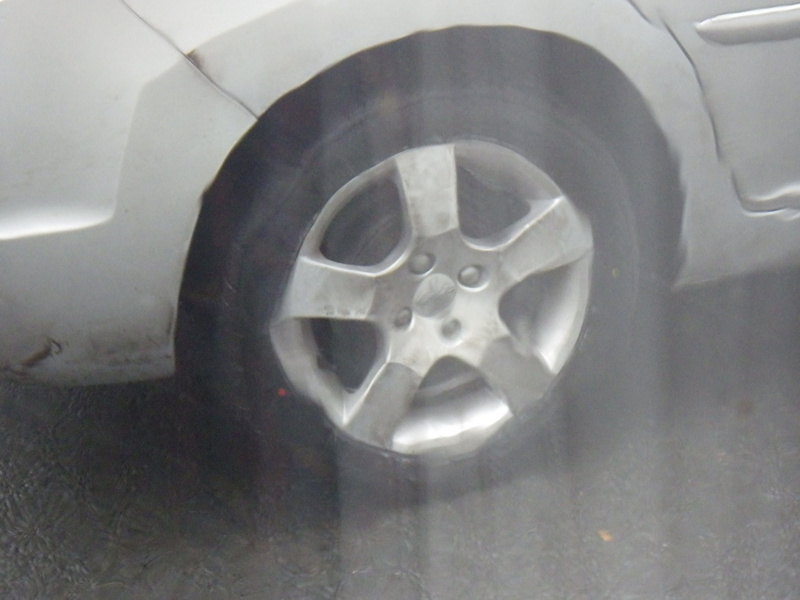 I explained my problem and he gave the wheel two sharp kicks in the centre at the top, at which point it fell off! He said he’d put the new wheel on whilst I cancelled my breakdown assistance. It was all sorted out in a trice and he disappeared before I could thank him properly. And the moral of the story? Well, there are probably two. First that the world is full of kind people, and second that some problems are solved by a well-aimed kick! Reminds me of the story of the engineer called in to sort out a problem in the engine room of a steam ship. The ship’s crew had already tried a lot of ideas to no avail. The engineer walked in to the engine room, ducking to avoid the low pipes crossing the ceiling. He then walked up to a red painted valve and tapped it smartly with a hammer. He then presented the ships captain with a bill for £100. The engineer proceeded to itemise the bill. When I told the man in the tyre place what happened, he pointed to the exact spot and said ‘just here’… fortunately neither he nor the BMW man charged me for the knowledge! Apparently this is a well-known secret among Husbands, who like to maintain their wheel-changing mystique… It was kind of him to reveal it to you. Just another example of Secret Men’s Business, according to the HoC. Hope your sister is settling into her new home without trouble. She is settling in, thank you. Well, the secret’s out now… tell your female friends! I’m so glad a Knight of the road stopped to help. It restores your faith in human nature to find nice people all over the place. That sort of kindness is always touching… there truly is nothing in it for the helper and such a lot for the person being helped. And he got to be a hero, all without getting his hands dirty. Nice job. I didn’t spot a comb, but I did have other things on my mind!